“Apple and Google know the other is their primary enemy,” says one of the people, who’s familiar with Apple’s thinking. “Microsoft is now a pawn in that battle.” Apple is also working on ways to manage ad placement on its mobile devices, a move that would encroach on Google’s ad-serving business, the person says. Let’s step back. Apple and Microsoft, in case anyone has forgotten, are intense competitors as well. Adding Bing to the menu of search options on the iPhone, however, is the right thing for Apple to do. Making Bing the default search provider on the iPhone is quite another matter. The BusinessWeek article quotes Nielsen data that 86 percent of US mobile searchers used Google and 11 percent (higher than the PC number) used Bing. Becoming the default search provider on 70 million (roughly) iPhone OS devices would be an enormous boost for Bing. (One question: is Microsoft offering Apple money?) Such a move would potentially impact Bing’s share and mobile exposure more than Microsoft’s massive search and ads deal with Verizon (complete with hundreds of millions in revenue guarantees). Many Verizon BlackBerry users became upset when Bing showed up one day as the default search provider on their handsets. That “backlash” led Verizon to have to explain to users how to get Google back on their BlackBerry devices. The average iPhone user is going to be more sophisticated and better educated than the average PC user and so “switching back” will be a behavior many would likely engage in. Still Bing would pick up usage. How much is uncertain. Even making Bing a search option (if not the default) would boost Bing’s mobile visibility and share. At one point in December Bing’s iPhone app was in the top five free apps in the iTunes store. My prediction is that Apple will not make Bing the default search provider, but it will likely add Bing as an option for the iPhone. 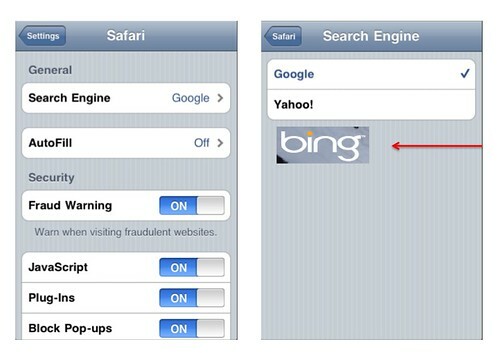 See also our follow-up post, Bing As iPhone Default Search Engine Part Deux.